Converting videos to a compatible format for mobile devices is always a chore. When software isn’t included, finding the right tools is difficult. A quick Google search always brings up spam-l;ike solutions, which are often trial versions or ridden with malware. Fortunately, Participatory Culture Foundation comes to the rescue with Miro Video Converter. Yes, it’s the same folks behind the popular Miro HD video player. Their new open source video converter tool hopes to simplify video conversions with just a single click. 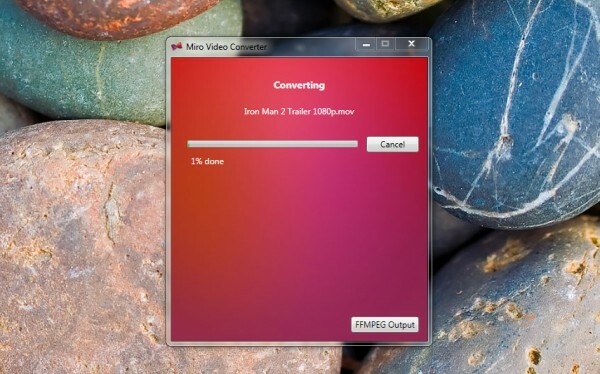 Miro Video Converter has a truly easy-to-use interface. Users can drag a video file into the program’s window or use the browse tool to navigate to a file. If the selected item is a compatible video format, it displays the text “Read to Convert.” A single drop-down menu displays options for supported output formats. For Android phones, these include the Droid, Nexus, G1, myTouch, Eris, Hero, and a few others. For Apple devices, it includes support for the iPhone, iPod Touch, iPod Classic, and iPod Nano. There’s no mention of the iPad just yet, but the iPhone format should be completely compatible. Finally, it also has official support for Sony’s PlayStation Portable. After selecting a device, the “Convert!” button initiates the process. Encoding videos will vary from computer to computer due to different processing capabilities, however re-encoding an hour-long 720p HD video took about 20 minutes on my Dell XPS M1530 that runs on a 2.5GHz processor. Although I didn’t have a chance to compare it to other tools such as HandBrake for the purpose of this review, I felt it was noticeably faster. When a conversion is complete, the new file will reside in the same folder as the original with a new filename. A link should also be present in the program to direct users to the file. While Miro Video Converter may not compare to some paid solutions, it still gets the job done. While computer geeks may resort to using command lines to convert content with FFmpeg, Miro is a great option for the rest. In my opinion, the easy-to-use interface is one of it’s best features. If you own watch videos on an Apple device, an Android phone, or a Sony PSP, Miro Video Converter deserves a test drive. After all, it’s free and open source.